In this picture, you see the representation of the recognition of my achievements on this blog. Camp Necon is a wonderful get-together, and I haven't blogged about it for several years. NECON is like rock and roll camp for writers. I get to mingle with fantastic people, talented writers, people whose work I read and respect, in a congenial atmosphere. Because it's limited to 200 people, I don't get that 'crowd exhaustion' I get with larger conventions, where I have to get away from the convention I am attending just so I can have some breathing space. I'd name all the people I'm pleased to have met or got reacquainted with, but that list would be as long as the Campers list itself. The traditions of NECON, passed down from the late and greatly beloved Bob Booth, remain in place. Single track panels mean that you never have to choose between which panel you want to see. A roast of unique local hot dogs, called Saugies, while everyone meets and greets. There is a level of camaraderie sharing that is unlike any other get-together I've ever attended. I have said it before and I will say it again, NECON is my family of choice. They are surprisingly generous, in perspective, their experiences, and their time. Special thanks to Jim Moore for setting me straight about something I had tangled up into a knot in my head. And Vikki Ciaffone. And Errick Nunnaly. And Bracken MacLeod, Dana Cameron, Matt Bechtel, Mary Booth, Trish Cacek, Craig Shaw Gardner, Beth Massie, Barbra Gardner, Cort Skinner, Gemma Files, Laird Barron, Weston Ochse, Yvonne Navarro, Larissa Glasser, Jeff Strand, Greg Dearborn... of hell with it. Everyone at NECON deserves thanks for being there, for making a wonderful and family atmosphere, even if I didn't interact with them much. At the end of NECON 37, fezes are handed out. 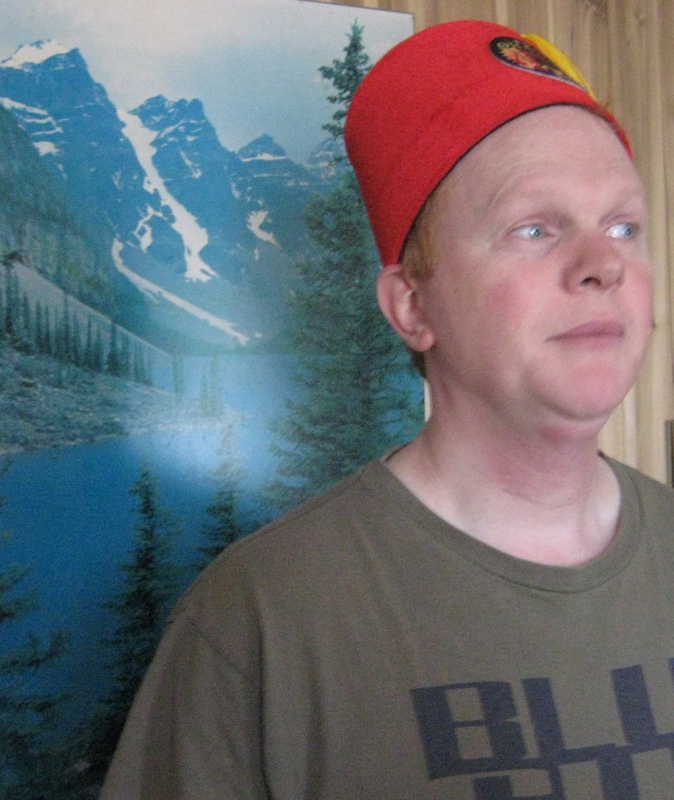 During the weekend, the organizers chose actions they deem 'fez-worthy.' My admission that I wad watched 89 kaiju for My Year of Monsters films was deemed 'fez worthy'. This means that I was recognized, by a group of my peers, for this blog. For my pursuit of obscure kaiju films. So thank you to my readers, for keeping me going, for encouraging me. This fez is for you. No one envies the person who has to follow a legend. Swamp Thing was one of the most popular comics around, and when Len Wein departed the series, someone had to be found to replace him. Enter David Michelinie, with Nestor Redondo already working the art. Michelinie’s plots were a bit more overt presenting the problem right off, rather than working up to them, as Len’s scripts had done. The majority of the plot is then solving the problem, rather then defining it. His first story is “The Tomorrow Children” (likely a reference to the Thames Television show which first aired in 1973), in which Swampy meets a group of deformed but psychically potent children. As a freak himself, Holland immediately sympathizes with the children, and acts as their protector. Once an angry mob with flamethrowers start a fire, the most powerful of the psychic children sacrifices herself to save a ‘normal’ boy. But Micheline is canny enough to make the ending bittersweet. The remaining children find another protector, but he isn’t willing to expose his new charges to the public. Swamp thing walks away in disgust. Given the enormous success of both the book and film version of The Exorcist (1973), it was inevitable that some of it would leak into Swamp Thing. But “The Soul-Spell of Father BLiss” has an interesting twist, as the priest in the story uses the Devil’s magic in an attempt to hasten the end of the world. Like Anton Arcane, he imprisons Alec Holland’s soul, but instead of taking it himself, he leaves the body open for a demon. It gets a bit messy. This is also the beginning of a more supernatural arc for Abigail Arcane, which peters out when the series ends. In issue 16, “Night of the Warring Dead”, Holland finds himself on a remote island, entangled in a native insurrection. Written three years before Warren Zevon’s “Roland the Headless Thompson Gunner” the two works clearly draw from the zeitgeist. An island revolution involves Laganna, the last priestess of her people, and Adam Rook, a disaffected Vietnam Vet unable to find his way in the world that doesn’t involve a gun. Like many of Michelinie's stories, it's a downer, and if not exactly Gothic. 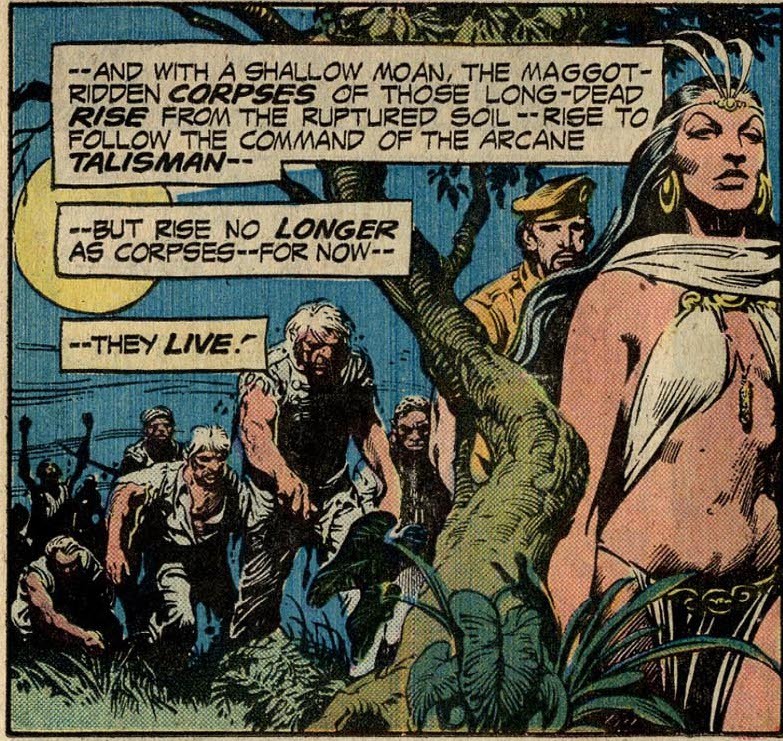 But like many of Michelinie's stories, they are tragedies drawn from contemporary times, rather than classic stories. This story is much more grounded in then-current political realities than Wein's work. “The Destiny Machine” resurrects, comic-book fashion, Nathan Ellery, the leader of the Conclave. Michelinie continued to use Len’s characters of Abby Arcane, Matt Cable, and Bolt, although Bolt was often separated from the group or unconscious, as if Michelinie didn’t know what to do with him. There is also a repetition of the object without which the enemy cannot work, which allows for a quick resolution. The demons in the “Village of the Doomed“ cannot survive without their book, Laganna can’t command the dead without her talisman. Once the object is destroyed, the threat dissolves. Michelinie doesn’t have the heroes celebrate, however. The villain is always sympathetic, so there isn’t any cheering, and always sympathy for the individual who has fallen from the side of righteousness. One of Michelinie's recurring themes is hypocrisy and the evil done by those willing to employ dishonest or destructive means to achieve their ends. More than Wein, Michelinie developed the background of his villains and antagonists. Father Bliss, Laganna, Dr Pretorus, all use terrible means to achieve what could be seen as noble goals. These characters and themes are very different from say, Gerber's Man-Thing, although both were political. Gerber concentrated on the protagonists, and his antagonists tended to be less developed. With Issue 19, Gerry Conway, the original writer for Man-Thing, took over. Conway had a very different sense of the Swamp Thing, and here and there I can see hits that Conway regarded Swamp Thing as very similar to Man-Thing. Like the transformation of the Skywald Heap, Swamp Thing now has a mindless self, without the guiding intellect from Alec Holland. 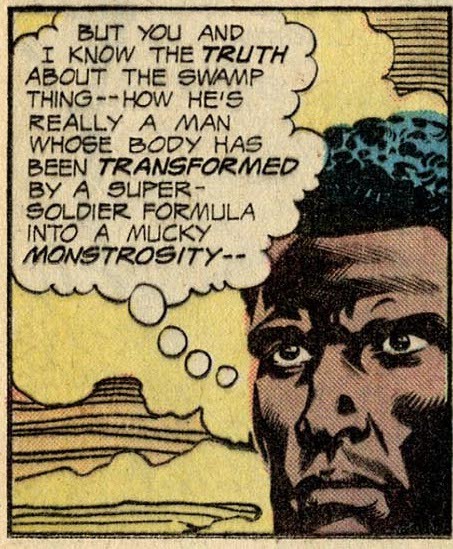 It comes from the cut-off arm from Swamp thing #5, which has regenerated into an entirely new Swamp Thing. Also similar to Gerber’s Man-Thing #7 (July, 1974), the Swamp Thing encounters one of the great legends of the Florida swamps, the fountain of Youth, and a motorcycle gang, also reminiscent of Gerber’s Foolkiller introduction the previous year in Man-Thing #3. There’s also a developer (who is no F. A. Schist) building something in the swamp. Conway even slips in issue #20, ascribing the Man-Thing’s origin to Swamp Thing. But the mindless Swamp Thing clone enables Conway to be rid of Cable and Abby and Bolt, and he seemed interested in building his own cast of side characters, if his run had not been cut so short. 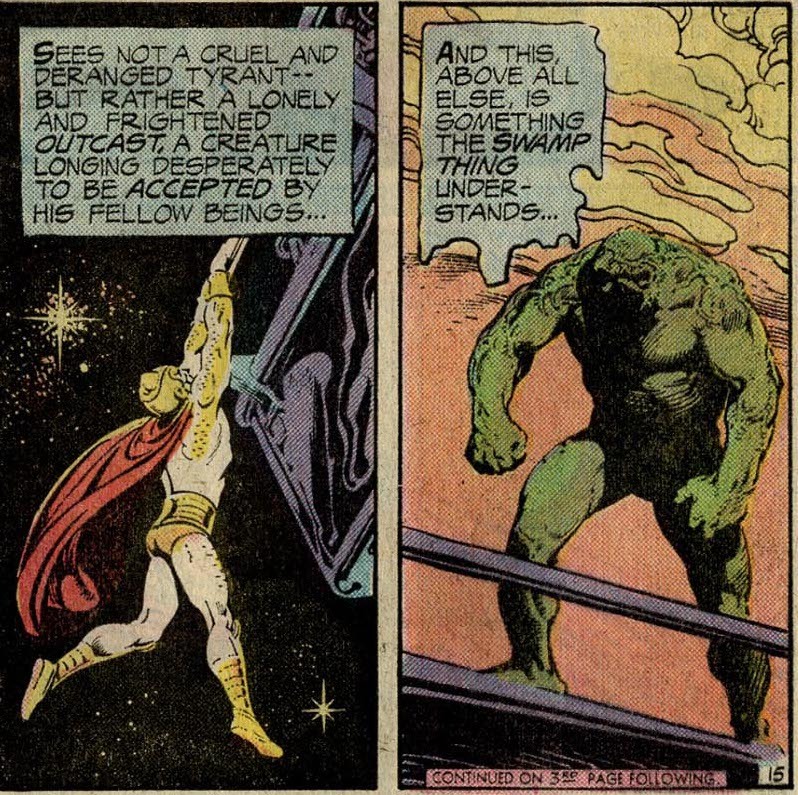 Simultaneous with Issue 19, October 1975, Batman and Swamp thing got together again in the Brave and the Bold #122, story by Bob Haney, art by Jim Aparo. “Hour of the Beast.” In which hustler B. B. Riggs captures the Swamp Thing and brings him to Gotham as a freak show. 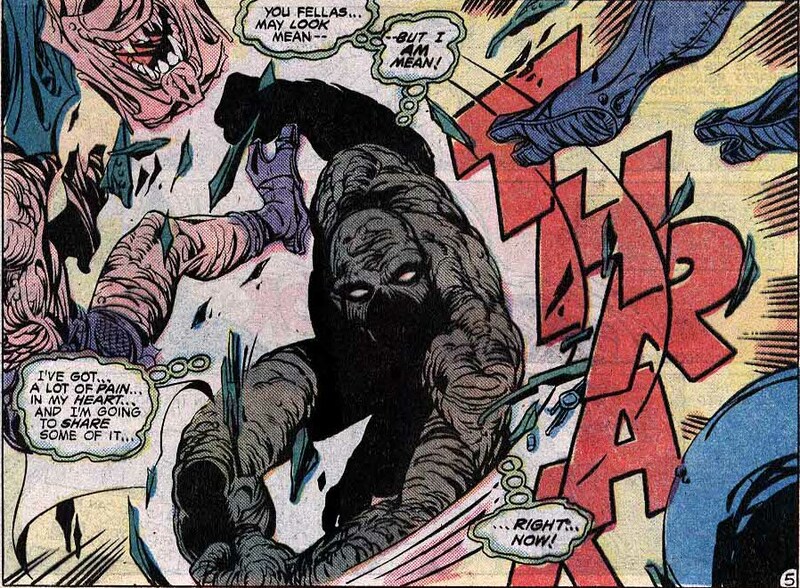 The capture is accomplished with the same sort of foam that was used to capture Swamp Thing in Len Wein’s last issue “The Leviathan Conspiracy” (#13). Gotham is, coincidentally, hit with a rapidly-growing plant that threatens to take over the city. This is something Swamp Thing himself will do during Alan Moore’s stint as writer. But the story doesn't rely on Holland's intellect as a biochemist, but more on his strength. Again. Michelinie returned for issue 21, which is unlike anything else done on Swamp Thing. Solus, an outcast alien and collector of freaks, beams Swamp Thing into his ship for his menagerie. It’s an interesting and very weird story, a science-fiction Gothic fairy tale. It is also the last story most people involved with Swamp Thing acknowledge. Issue 22 returns to Michelinie’s initial story, in which a government conspiracy has a scientist capturing and sequestering human mutants which have been contaminated with radioactive pollution. None of these have psychic powers, however, although they have the same noseless face and unnaturally yellow skin as the mutants in issue 14. They also share Father Bliss’s desire to save the world by destroying it, as a madness comes on many of the mutants. But just when it seems like a by-the-numbers story of madness, he ends the story with a touching homage to Whale’s Bride of Frankenstein. Redondo does a very good job of making the Solomons’ last moments poignant. Again the story beneath it bears many common David Michelinie tropes. Conway returned with issue 23, “Rebirth and Nightmare” and decided to take the unfortunate route of giving Swamp Thing what he was seeking. Holland, with the aid of his brother (a road never returned to by any later writer) Edward Holland, also a biochemist, and his live-in graduate student, Ruth Monroe. Alec Holland regains his human shape, and becomes a Hulk-like transformer. This only lasted for two issues. The final (published) issue of Swamp Thing, #24, “the Earth Below” was written by David Anthony Kraft (with plot idea from Gerry Conway), illustrated by Ernie Chua and Fred Carrillo. No doubt this shifting of the creative team was the result of low sales, and presaged the cancellation of the series. 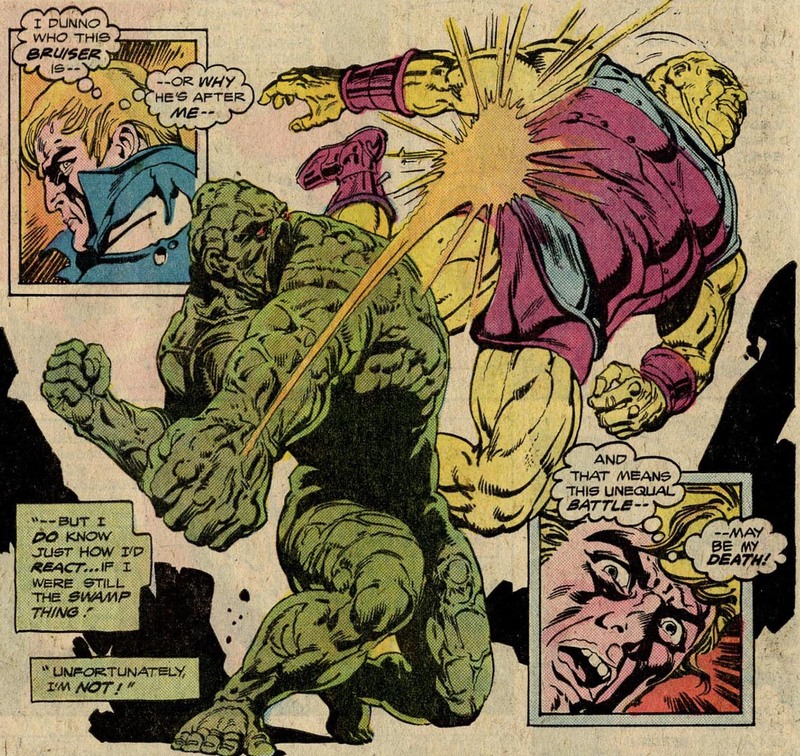 With the help of his brother, Holland recreates the conditions that turned him into the Swamp thing, but setting off an explosion near the Swamp Thing, with the laboratory chemicals exactly as they were during the initial transformation. There’s a pool of clean water for him to dive into. Ultimately, makes about as much sense as frying a fried egg to make it raw again. Once human again, Holland is attacked by a thick-muscled Thrudavig, and spends the whole issue wishing he could be the Swamp Thing again. It’s a bit frustrating, since the ‘he gets what he wants but he misses what he used to have’ schtick is old. Issue 25 was a promised Swamp Thing vs Hawkman issue. Some of the penciled sketches have been leaked on line. Swamp Thing was still pursued by Colossus, a criminal organization with governmental links (Sabre, a villain with a saber for a left hand, is a former federal agent). This thread was picked up again a few years later by Martin Pasko in his recrudescence of the Swamp Thing in 1982. Holland seems to be alternating between the Swamp thing and his human form, but I have only seen some of the pages, so I don’t know exactly how this works. The duality of Holland and Swamp Thing turning into each other certainly has its roots in Gothic literature, the well-known and often imitated Strange Case of Dr. Jekyll and Mr. Hyde; Bruce Banner and the Hulk likely being the most famous version of the idea. However, the Swamp Thing is again being pursued by a shadowy organization, this time the Colossus. Swamp Thing has long interacted with such organizations, beginning with Nathan Ellery’s Conclave, to this truncated encounter with Colossus, and later the omnipresent Sunderland Corporation from Marty Pasko, which had links to the federal government. Alan Moore Sunderland used to bedevil the character. And although the events of the Gerry Conway Swamp Thing are ignored by all later writers, there are elements that were perfectly in keeping with the character as it had been subsequently written. But Jerry Conway wasn’t done with the Swamp Thing. Less than a year after the book’s cancellation, Swamp Thing became a guest star in the Challengers of the Unknown, a science team, primarily of non-superpowered individuals. The science aspect theoretically allowed biochemist Holland to fit in reasonably well, but that wasn’t the way it worked out. Issues 82 and 83 pick up with M’nagalah, the Lovecraftian horror encountered in Swamp Thing #8. One of the Challengers becomes infested with M’Naglah, and team seeks out Dr. Holland, who has reappeared, working with his brother. At the end of issue 83, Holland returns to his Swamp Thing form, with the little note that apparently the cure developed at he end of Swamp Thing wasn’t so permanent after all. Issue 84 begins with an encounter between Deadman and the Swamp Thing, an association that will be reaffirmed several times, both in Alan Moore’s run-up to issue 50 and also in the Justice League Dark storylines. In saving the professor, Swamp Thing becomes an unofficial member of the group, even though he can’t wear the standard issue Challengers’ uniform. They go through a couple of adventures, including a war in the far future where everything is dystopically horrible. But it’s not particularly interesting, and the Swamp Thing isn’t used for anything but his brute strength. Which is a pity. The Challengers of the Unknown stories move away from the Gothic and more into the adventurous and brightly-colored world of super-science. There is a fistfight in every issue, and overall, the stories aren’t that interesting. They certainly don’t add anything new to the story of Swamp Thing, who is utilized more like the Marvel Thing: inhumanly strong, and resilient. The Challengers of the Unknown ended with issue 87, June/July of 1978. Less than a year later, in April 1979, Swamp thing returned in DC Comics Present #8: “The Sixty Deaths of Solomon Grundy.”. Having teamed up with Batman twice, Swamp Thing is this time allied with DC’s other big hero: Superman. Notably, the story is by Steve Englehard, who would be instrumental in getting Steve Gerber into the Ultraverse, and the invention of his own swamp monster, Sludge. Solomon Grundy isn’t on my list. Although he is initially clearly descended from the same root as the Heap and Swamp Thing, he loses his swampiness early on. He is more a zombie that comes from the swamp than a swamp monster, despite being described by Green Lantern (in All-American Comics 61, all the way back in 1944) as made of wood and leaves. 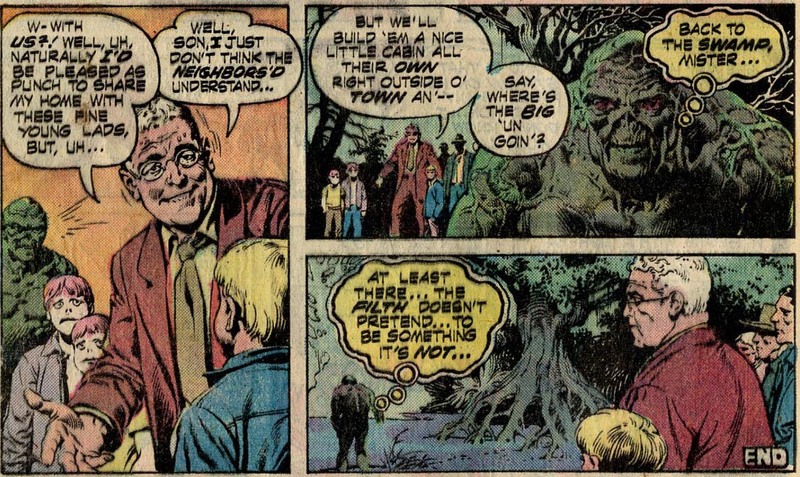 Swamp Thing pursues Solomon Grundy, realizing he has the opportunity to study something he believes is similar to himself. Unfortunately, Superman only wants to put Grundy away. Swamp Thing cannot communicate easily with Superman, so he is forced to assist Grundy as the only way he will be able to study the plant zombie. He manages to do so, in a random underground lab he has discovered, and discovers that Grundy is not like him. Grundy is not alive, and therefore, not like the living plant that is Alec Holland. The story has a bit more depth than I initially thought it would. And thus the first iteration of DC's Swamp Thing, which began so strongly, suffered the fate of many characters. Used by writers who don't really understand the appeal of the character, guest appearances shoved the Swamp Thing into a role to which it is not suited. Thus is a common occurrence in comics, where characters become communal property. Anyone can use the character, even those who do not understand its nuance. This slow petering out might have been the end for Swamp Thing, but Wes Craven purchased the rights to the story and made a film of the property. More on that later. But before I get to that, there’s Atlas’ Bog Beast, an oddly different sort of swamp creature.